Here's a drawing I did about 15 years ago, I think. It was done originally for a newsletter regarding all things Disney that I used to contribute to back then. "20,000 Leagues Under the Sea" is one of my favourite Disney live-action films. This is the type of film that I wish the Studio would do more of today with the kind of flair they used to be capable of. I suppose it isn't even possible anymore, though, as the look of that era of filmmaking was achieved through different means back then. Instead of the computerized imagery that supplements so much of today's epic films, back then they relied primarily on the skills of matte painters like the wonderful Peter Ellenshaw. I still think the results were far more lavish and appealing than what they do these days, but that's just me, I guess. I forgot that you had a blog! Nah, you didn't forget, actually. It's new as of this week. Watch out for the wet paint on the title banner! Yeah, I love classic older movies. Recently here in Canada we've finally gotten Turner Classic Movies added to our cable line-up. I've been recording tons of stuff, faster than I can watch 'em! In contrast, I barely ever watch anything on our contemporary movie subscription channel, TMN. I keep thinking I should just cancel it. Love the Kirk but others are equally appealing Peter! This is probably my favorite Disney movie. I also miss the touch of matte paintings. They were really incredible. I'm glad someone out there feels the same way. I think I recognize where this image was published. I just looked back through a few issues and found "The Happiest Millionaire," "Davy Crockett," and "Blackbeard's Ghost." I'll keep looking for the 20K piece. I can scan them with the text and send them to you if you like. Hey, that must be Daniel Bauer! Yes, this was originally drawn for the World Chapter fan club newsletter down in WDW land. You're right about the other film titles, too. In fact, I'll probably run the one of "Blackbeard's Ghost" in an upcoming post. Welcome to my blog, Dan, and spread the word down Orlando way! 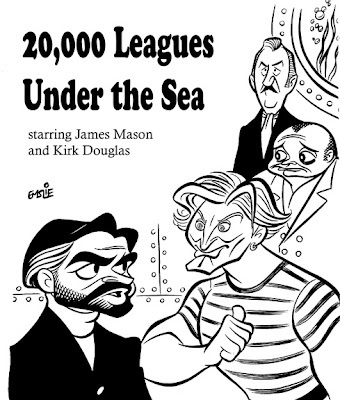 Wonderful drawing but particularly impressed with James Mason. I'm kinda new to your work, Pete, but it's fun to look at. Good luck with your Sheridan classes.